New Delhi: Highlighting the issue of air pollution, Union Minister of Environment, Forest and Climate Change, Dr. Harsh Vardhan referred to the role of science and technology in providing a solution and cited the significance of involvement of industries in taking forward the ground-level research to the field. Addressing the stakeholder consultation, involving industry associations, civil society and academia to discuss a roadmap for the mitigation of air pollution here today, Dr Harsh Vardhan underlined the importance of policies and regulations for addressing the issue. The Minister referred to the associated downside of such regulations when they sometimes become too restrictive in nature. He emphasised the streamlining of the mechanism and reforms of such laws, if needed. The Minister also referred to sustainability as a moral issue, which will form the basis for all actions and decisions. 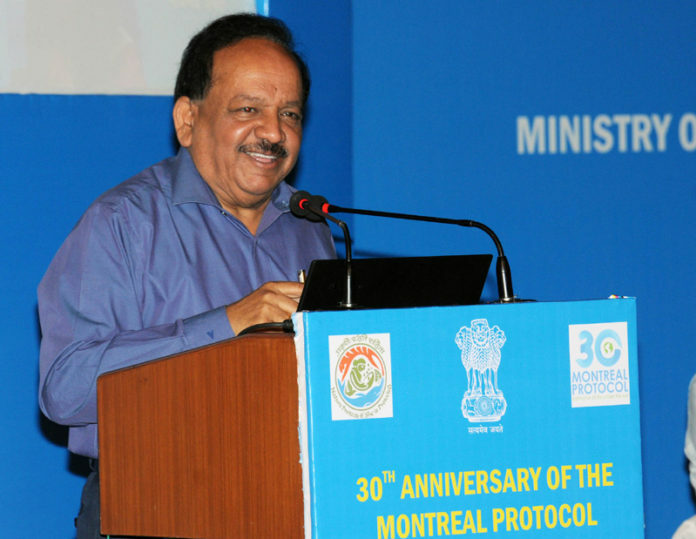 All the stakeholders were asked to furnish their views for evolving a roadmap for control and mitigation of air pollution, more specifically focusing in the short-term on ensuing winters and also for evolving a long- term strategy. Prof C. R. Babu, Centre for Environment Management of Degraded Ecosystem, University of Delhi suggested for a three layered vegetation strip with specific type of plant species having high pollution absorbing capacity as long term solution and proposed for planation covering of open areas under avenue tress and other barren industrial areas, and revival of sprinkler system as immediate short term strategy for dealing with winter pollution. GAIL Chairman and CMD, NTPC stressed on increasing use of natural gas as fuel alternative to Pet coke and furnace oil, while emphasizing on enforcement of the existing norms. They indicated their commitment to the cause and assured of all support including in plantation. Cement Manufacturer Association referred to pet coke as a safe option, if the standards are met. They indicated their commitment in meeting the standards and other environmental compliance. Dr Ravi Aggarwal, Toxic Link and Ms Anumita CSE said that awareness building is the most significant aspect and emphasized the role of RWAs in addressing the issue. Air Pollution is one of the pressing environmental challenges at present. The issue gets aggravated during winters due to various reasons, including increased emissions from various existing sources, addition of some of new sources as burning of crop residues, which coincides with onset of winters and adverse meteorological conditions. The month of October 2017 is also important, as India will be hosting the FIFA U-17 World Cup. Government has been taking many steps to address the issue. However, addressing the issue comprehensively requires a collective approach, involving all stakeholders, including industry, civil society and academia.